If you’ve been following me on Twitter, you might’ve noticed I’ve been on a bit of a Formula 1 kick this past week. I was finally able to follow a race for once (usually they’re on at some ungodly part of the morning I can’t be bothered to be awake for. ), Top Gear did a wonderful piece on a famous F1 driver (which you should all go watch after reading this column. And to keep it relevant, there’s footage of the Sega sponsored cars in it! ), the game I’ve been playing the most as of late (and actually went on a five store goose chase for) is an F1 game that was released in 2006. So, naturally, you’d assume that my game this week would be Formula 1 based. And then I saw this in my fellow addict Stevie Grant’s last column. This is just a very outdated racing game. Now I’m not really a big racing game fan but this game was just ugly. I know the graphics were probably mind blowing for it’s time but the big blocky graphics just make it hard to see. The Sega 32x itself also doesn’t help this because the controller isn’t suited for any 3D game at all. Like a lonely man on Valentines Day no one wants to play Virtua Racing anymore. And that’s a perfect excuse to make it number 8. The most boring header image of all time. I guarantee it. 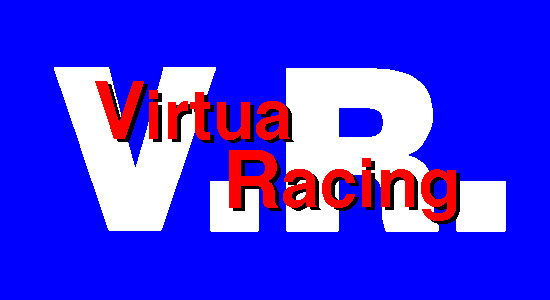 It might just be a lonely bloke on Valentine’s day now, but back in 1992, Virtua Racing was the big man on Sega’s campus. Originally an internal testing app for the new Model 1 arcade board, AM2 and Sega were so thrilled with the results that it was turned into a full arcade game, and the first game to be released on the Model 1. While it never reached the massive popularity of its spiritual successors, it’s still quite the important title in Sega’s history. As AM2’s first attempt at 3D, and as Sega’s first 3D racing game, it was absolutely stunning for its time, easily trumping other games in the genre visually. It’s no wonder Sega was so happy with it internally! From the cel shaded look of the car and the tracks, to the little particle effects shown when bottoming out or hitting the grass, everything was just breathtaking. And the framerate didn’t suffer at all, maintaining a crisp and clean rate at all times, even with all this newfangled 3D mumbojumbo going on. 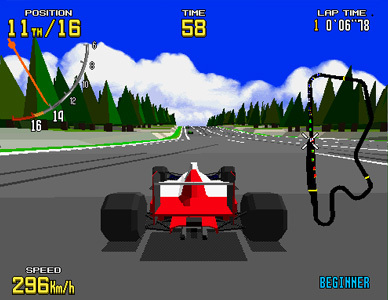 It also introduced what became a staple in Sega arcade racers, the VR View System, which allowed for four different in-game cameras to suit any player’s tastes, instead of being stuck in a predetermined “chase” view or in-car view. 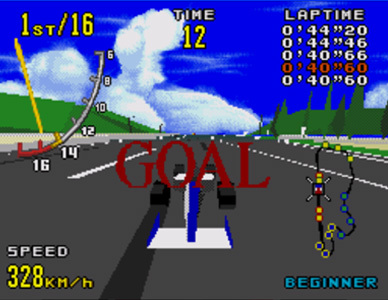 This would go on to become a staple in most of Sega’s arcade racers afterwards, and most racers in general started to use the “four views” system from that point on. 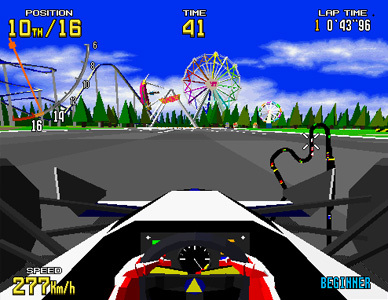 The in-car view of the arcade version. And it played pretty damn good as well. Then again, it’s a racing title from AM2. Would you expect anything less? It was wicked fast, and the tracks were really well done. And the car controlled decently enough, although it was definitely prone to understeer. The game was quite unforgiving, though. Barely tap an opposing car and you spin out. Touching the wall just slightly could send you into a flip. Even barely touching the grass would send you spinning off course. At this point, the game goes from pretty damn good to frustrating, at least for me. Not even that F1 sim I mentioned in the beginning is that unforgiving! By 1994, people were wanting a home release. There were a couple problems with that, though. The Saturn wasn’t due out for another year or so, and the Genesis itself didn’t have the ability to do polygons. So hope seemed a bit lost until Sega created the Sega Virtua Processor for Genesis, giving them the ability to make a somewhat faithful port of VR for the system. And for its time, it was unbelievable. The game was showered with praise, and even won a few “driving game of the year” awards in 1994. Looking back on it, though, it wasn’t exactly a looker. Sure, the “actual 3D” on a Genesis thing is still pretty amazing, but aside from that, it looked rather messy, and the slick framerate from the arcade version was reduced quite a bit. Adding in that people had to pay a hundred bucks for this game, and it most likely won’t work on any of their working Genesis consoles. Adding to that, the frustrations I mentioned above were somehow made even worse. Even just barely clipping the curbing of a curve would send you spinning this time, and controlling the car was a real pain at times… Not to take away from its historical value, but it really wasn’t worth a hundred bucks. And that’s where the aforementioned 32X version comes in. Released later in the year as Virtua Racing Deluxe, this version featured three more tracks, two new car classes (stock cars, as seen in Daytona USA, and Daytona Prototypes), and visuals closer to the arcade original. In fact, you could argue it looked better than the arcade version. You’d probably lose that argument, but I digress. The gameplay was also a bit closer to the original as well, with the framerate fixed and the steering not nearly as bad as it was on the Genesis port. There was also a Saturn port done by Time Warner Interactive, but since I don’t really have any experience with it, I can’t say anything about it here. And that brings me to the question of “How does it hold up?”. And I’m afraid to say that, after going back and playing through the three versions profiled here today, the answer is “not very well”. Again, I don’t want to take away from what this game meant to AM2, Sega, and hell, racing games in general, but the brutal unforgivingness, awkward-at-times steering (though this might be because I’m using a controller instead of a wheel), and in the Genesis version’s case, bad visuals just make this thing hard to play these days. I really did want to still love this like I did as a kid, back when I’d feed quarter after quarter into the local Big Lots’ arcade cabinet, but those days are over, sadly. And that’s why while I’m taking games like Daytona USA and Gran Turismo out on expensive dates, Virtua Racing will be, in fact, sitting at home, alone, just like Mr. Grant said. So, I know my thoughts on this differ from alot of folks’, so don’t be afraid to share your opinions on this, whether you’re in agreement with me or not, by commenting here, posting in the thread, or hitting me up on Twitter. There won’t be an article from me next week since I won’t have access to a computer, but while I’m gone, do send in your requests for games to be featured in future editions! This game wasn’t very good on the Genesis but I can assume the arcade and 32x versions played at least marginally better. It was an impressive game for its time. Yeah, 32X was easily the best home version that I played. It was really good in its heyday, but now it’s just frustrating.